The Project - Do Trees Have Nationality? 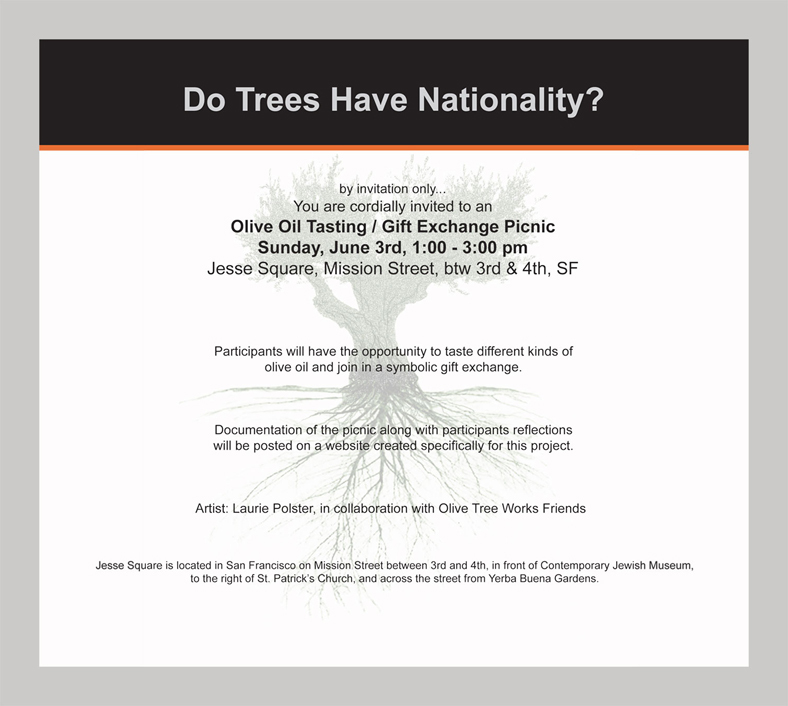 The Olive Oil Tasting / Gift Exchange Picnic was presented on Jesse Square in San Francisco, CA, on Sunday, June 3, 2012. Joining us on Jesse Square, invited participants – friends, museum goers, and passersby – were given the opportunity to taste several varieties of olive oil produced in different regions of Palestine and engage in a symbolic gift exchange. For receiving an olive branch, participants were asked to consider the olive trees in Palestine and offer their reflections on one of several questions that address the rights of trees, how their identity impacts their survival, and what our responsibility is toward them. Documentation of participants reflections from the gift exchange will be posted soon. The Project | Do Trees Have Nationality? raises questions about environmental responsibility in the context of borders, conflict and nationalism, by highlighting the destruction of olive trees in Palestine and the impact this has on ecological and social sustainability. 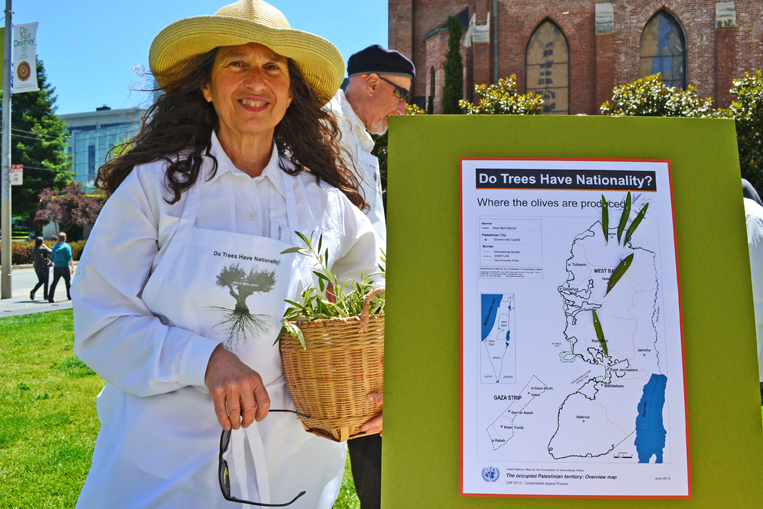 Presenting this project on Jesse Square, June 3, 2012, became a unique opportunity to frame these issues in conjunction with the current exhibition at Contemporary Jewish Museum, Do Not Destroy: Trees, Art and Jewish Thought. "The title of the exhibition Do Not Destroy (Bal Tashchit in Hebrew), is taken from a commandment in the Torah (Deuteronomy 20:19) that forbids the wanton destruction of trees during wartime. During the rabbinical period, this concept was broadened to encompass humanity’s responsibility to shield all of nature from unnecessary harm. This ancient evidence of environmental protection, along with the rise of a distinctly Jewish environmental movement, inspired the CJM to explore a parallel initiative within contemporary art practice. By creating works of art with the tree as a central motif, artists reference the real world while envisioning an alternative." What better way to symbolically use “the tree as a central motif [and] reference the world while envisioning an alternative” than by tasting the oil of the tree’s delicious fruit and participating in a gift exchange that brings home the endangered status of olive trees on Palestinian land[s], due to their destruction by the Israeli military and nationalist settlers. Given the oversight of this resonant topic from inclusion among the broad spectrum of critical issues addressed within the museum’s exhibition, we are gifting the June 3, 2012 presentation of The Olive Oil Tasting / Gift Exchange Picnic on Jesse Square, documented in the website about the project, as a public art corollary to the exhibition, Do Not Destroy.